Heat a non stick skillet (or well seasoned cast iron skillet) over medium heat. Add the oil and let it heat just until it begins to shimmer. Add the scallions and sauté one minute. Add the garlic and chile flakes and let it all sauté one minute more, making sure the garlic doesn’t actually brown by lowering the heat as necessary. Add the turmeric and stir until well combined. Add the quinoa, chickpeas parsley and about 1/4 cup of water. Season to taste with salt & pepper and stir it all together. Let it cook for a minute, if needed, to help the water evaporate, and serve! As a main dish I’d love it over a bed of spinach salad simply dressed with lemon and olive oil. As a side dish it’s great with grilled or stewed chicken, or even some simply grilled halibut rubbed with tandoori spices. 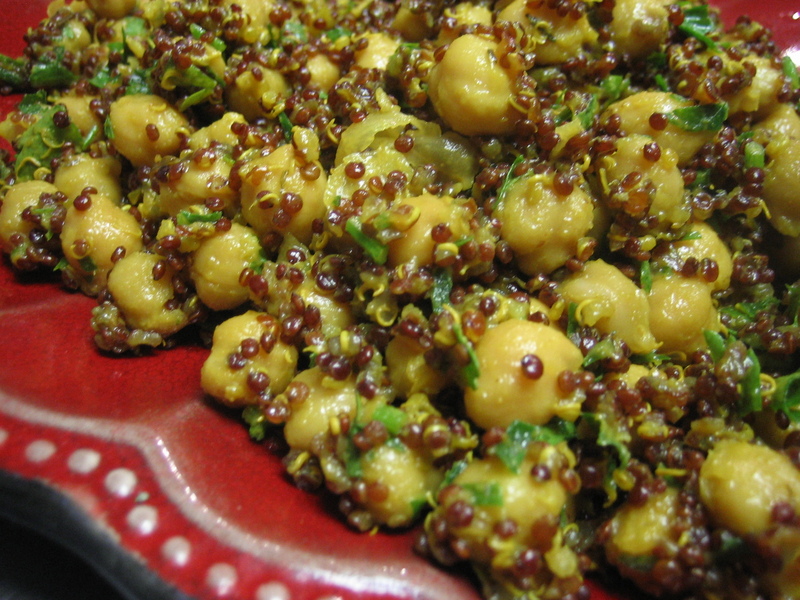 This entry was tagged chickpea recipes, dairy free recipes, entree recipes, gluten free recipes, low fat recipes, main dish recipes, side dish recipes, vegetarian recipes, whole grain recipes. Bookmark the permalink.